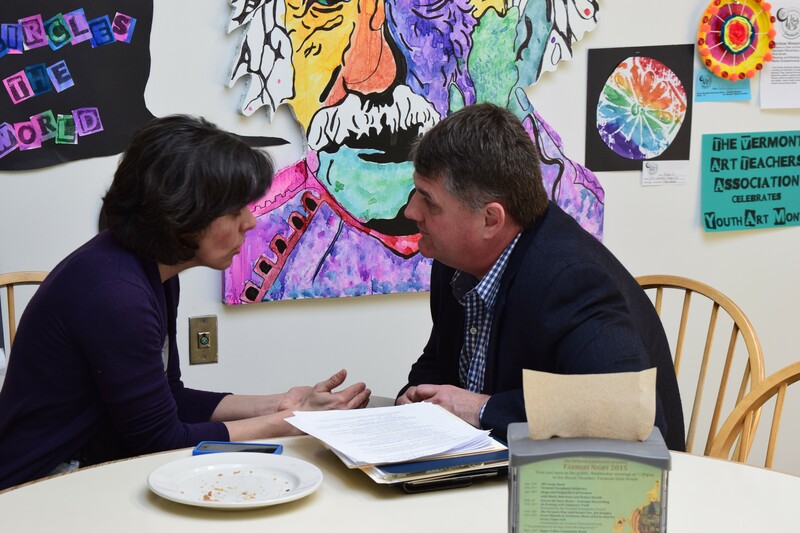 House Appropriations Chair Mitzi Johnson (D-Grand Isle) talks Monday in the Statehouse cafeteria with House Minority Leader Don Turner (R-Milton). Cutting $53 million from the state budget was a grueling process, members of the House Appropriations Committee said, but when they finished Monday they were all on board. “Good work, team,” committee chair Mitzi Johnson (D-Grand Isle) said just after the committee voted 11-0 to send the budget plan to the full House. That body is likely to be more divided when the bill comes up for debate on the floor Thursday and Friday. Republicans say it depends too heavily on new taxes. Progressives argue it would cut too many programs. The $5.5 billion overall budget plan contains a 1.4 percent increase over this year's budget. The $1.5 billion general fund would be up 4.8 percent. The budget bill includes a last-minute deal that could temporarily stave off the Shumlin administration’s proposed closure of two of the state’s four emergency call centers. The bill would provide $425,000 in funding for all four centers through September 15 to give local and state officials time to work out an alternative. The budget then would cut off funding for two centers to save nearly $1.3 million, Johnson said. The bill offers no solution to the standoff between the Shumlin administration and state workers over the governor’s proposal to seek $10.8 million in personnel savings. The House budget also depends on that savings. The House committee did include recommendations for how to achieve those savings, specifying that any layoffs should include management as well as non-management positions, and that pay should be frozen for high-salaried appointees. The committee worked from a long list of suggestions of what to cut. Johnson said committee members will prepare a list detailing the plan, and will be ready to explain it to other legislators. “People will have no idea. Did you get rid of the governor’s office?” she joked. Johnson, in her first year as committee chair, also promised a shorter, more informative explanation of the bill on the House floor than has been done traditionally. “A three-hour presentation on anything is brutal,” she said. Though House Minority Leader Don Turner (R-Milton) said Monday that he expects a majority of his caucus will vote against the bill, the four Republicans on the House Appropriations Committee felt differently. Committee vice chair Peter Fagan (R-Rutland) said he thinks the budget, which reduces the amount of one-time funds used and calls for agencies to prove the worth of programs, does a good job of planning for the future. “As soon as I saw it going in that direction, I was on board,” Fagan said. Turner said, however, that the majority of the 53 Republicans in the 150-member House would have chosen different measures, including cutting funding for the Vermont Health Connect insurance exchange, which has been plagued by problems. After spending two and a half months scouring the budget for places to cut, first-year committee member Diane Lanpher (D-Vergennes) was looking at the positives Monday. Hours before the committee passed the budget, she managed to find $8,946 to save a program for the blind. That felt like a triumph, she said. “When you’re reaching to that level, you’re getting really down there,” Lanpher said.